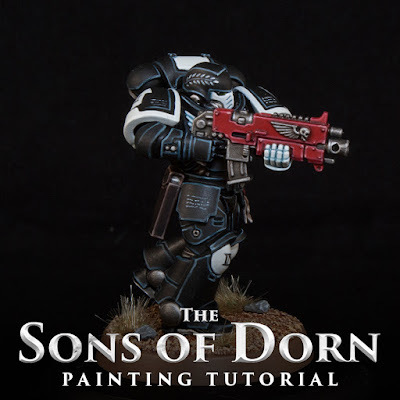 When I first saw the new Primaris Marines I went through a few different ideas of how I would paint them, Ultramarines, Flesh Tearers, Crimson Fists; but in the end I decided this was the perfect opportunity to resurrect my own chapter from more than 10 years ago, the Sons of Dorn. I primed the model Black and then painted the whole thing with a thin coat of Abaddon Black. 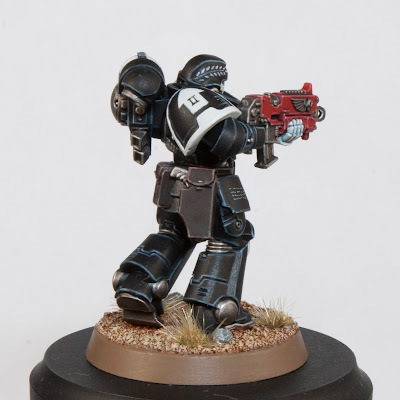 This is because the black primer and Abaddon Black are slightly different colors, and we want our black to be consistent if we need to tidy up later on. I also painted mine in subassemblies, keeping the backpack and gun with the arms attached as separate pieces while I painted it to make it easier to get to everything. 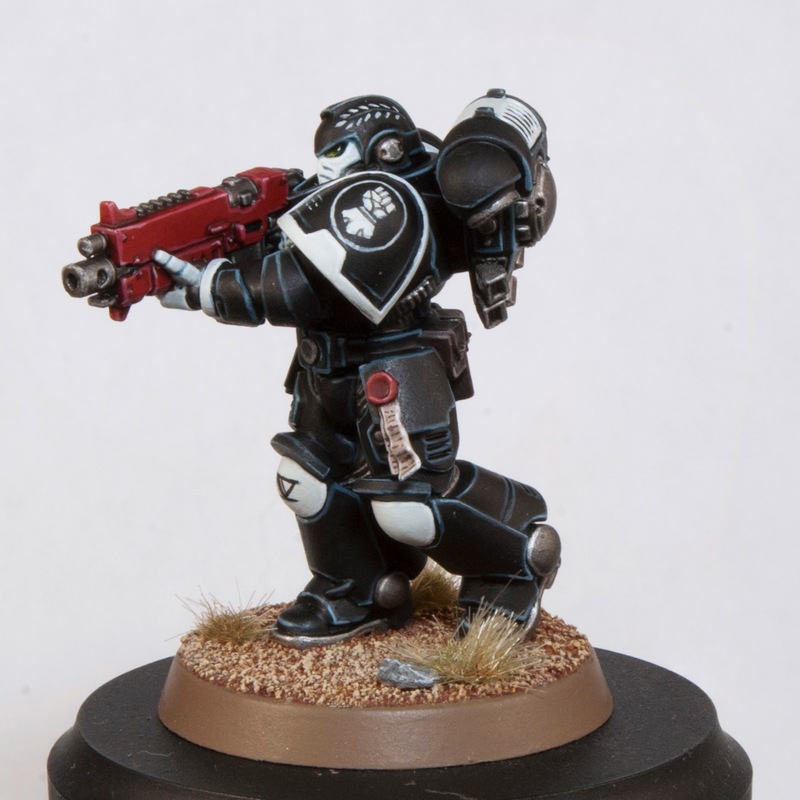 I then edge highlighted all of the armor that would be black with Dark Reaper. There are a lot of edges and armor panels here, so take your time and be neat. I then did a second highlight of Thunderhawk Blue, keeping this slightly thinner then the Dark Reaper step. Finally, I did a selective highlight of Fenresian Grey. I only did this around corners and other areas I really wanted to emphasize. All of the areas that were going to be white were base coated with Ulthuan Grey. This took several layers to ensure a smooth and solid coverage. In the future I will probably do a coat of Celestra Grey first since it is a Base Paint and will hopefully give me a good, solid grey to paint the Ulthuan Grey on top of. The white was then shaded with Thunderhawk Blue. This helps keep the white in the cool spectrum and also ties it into the colors used on the black armor. I watered this down and only painted it on the areas that would have shadows, so the chest eagle, face mask, and hand on this model. The knees and shoulder trim didn't have any crevices, so they didn't need any shading. Be very careful in this step, but you can fix any mistakes with Ulthuan Grey before moving onto the next step. Lastly I edge highlighted the Ulthuan Grey with White Scar. I did this in the same way I highlighted the black armor. Again, be very precise here. All of the metallic areas were base coated with Leadbelcher. This included all of the "soft" armor in the joints, the stabilizers on the ankles, the gun, the exhausts on the backpack and the power source thing in the middle of it, and various other little areas. All of the metal was then washed with Nuln Oil. The final step was to highlight it with Stormhost Silver. Just pick out the edges and ridges. The red areas, the bolter casing and wax on the purity seal, were base coated with Mephiston Red, and the parchment with Rakarth Flesh. Do two thin coats here to get a smooth and solid coverage. 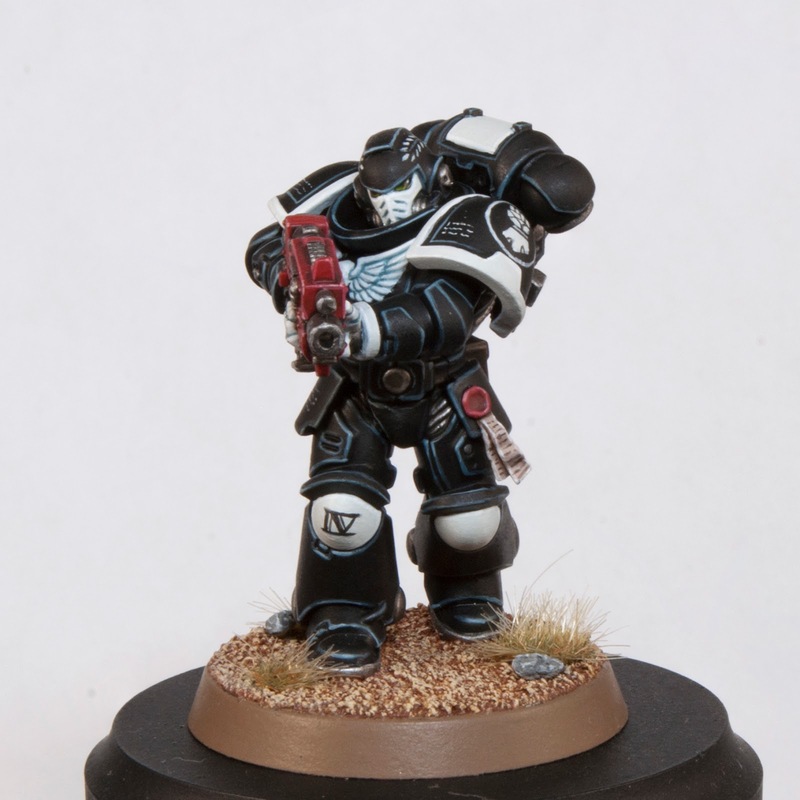 The purity seal was given an allover wash of Agrax Earthshade, while on the gun it was only painted into the areas it needed to go, such as the recesses and around the rivets and other raised detail. Tidy up an mistakes on the bolter with Mephiston Red before moving on. The red was then line highlighted with a mix of Mephiston Red and a little bit of Screaming Skull. The red was finished with a selective highlight of Mephiston Red with even more Screaming Skull mixed in. I focused on corners and on the rivets. The parchment was tidied up with Rakarth Flesh, then highlighted with White Scar. All of the leather pouches were base coated with Rhinox Hide. They were then washed with Nuln Oil. The first edge highlight was with Gothor Brown. The final highlight is a mix of Gothor Brown and Screaming Skull. After this was done I also went back and painted the buttons on the pouches and the winged skull on the bolter metal following the steps used above. 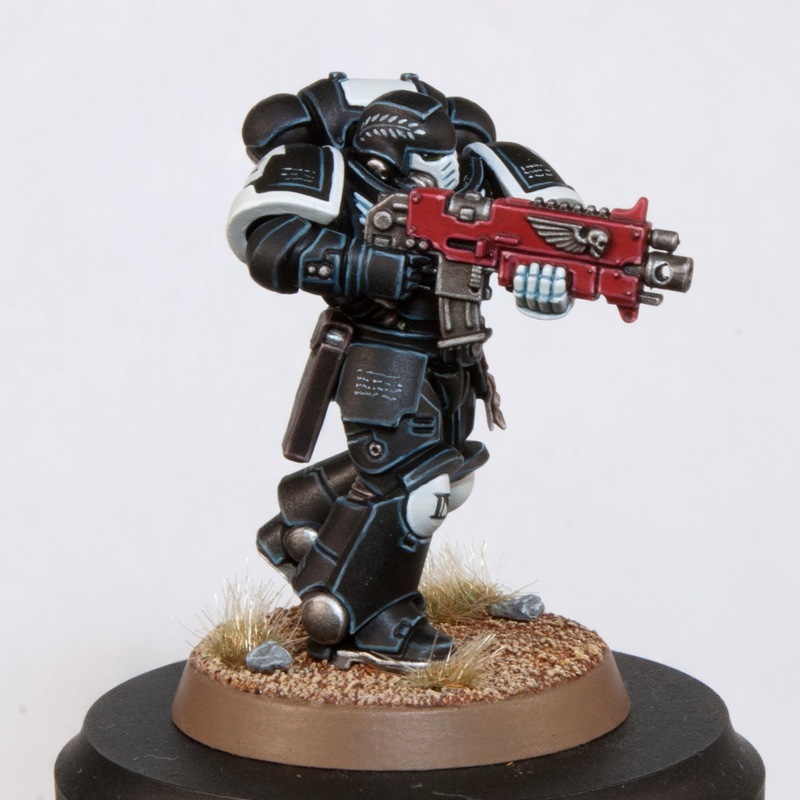 Any of the lenses on the model were base coated with Abaddon Black. I then painted Caliban Green into the front half of them and did two highlights by mixing in more and more yellow and painting slightly smaller areas of the lenses each time. This was finished off with a spot highlight of White Scar on the back half of each lense. On my model I did a bunch of freehand for all of the numbers, squad markings, chapter symbol, and text. You can use transfers where you want to though. 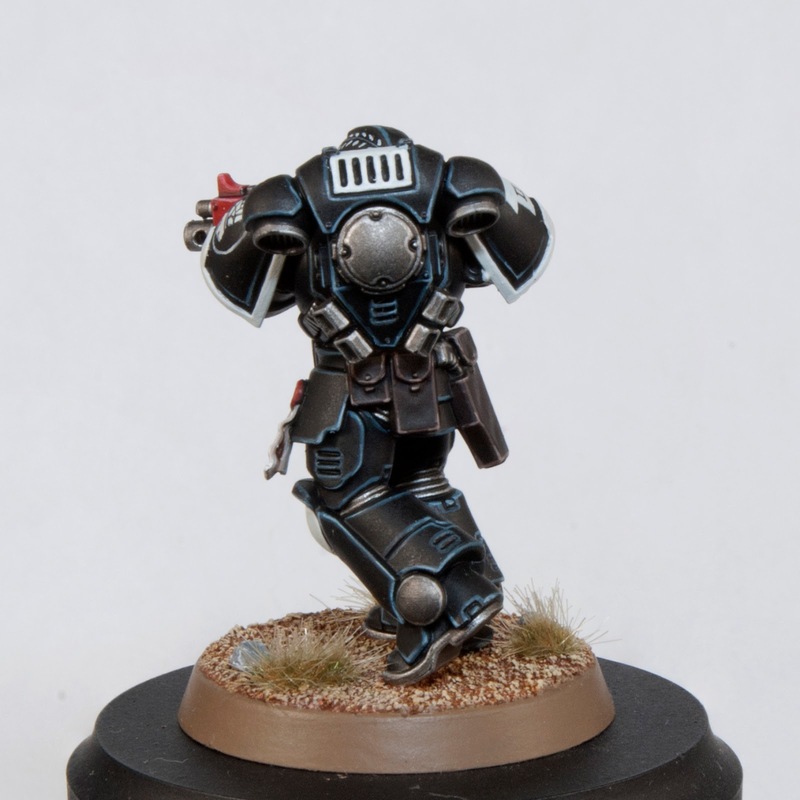 The only thing you will have to freehand is the chapter symbol since there is no transfer for the white fist. I painted all of my white freehand on with Ulthuan Grey. I really like how he turned out in the end. It took a little longer than I originally planned, but that's because I have a problem sticking to the idea of a "fast" paint scheme. I always want to push it a bit further, do one or two more highlights. I'm particularly happy with the Chapter icon freehand. 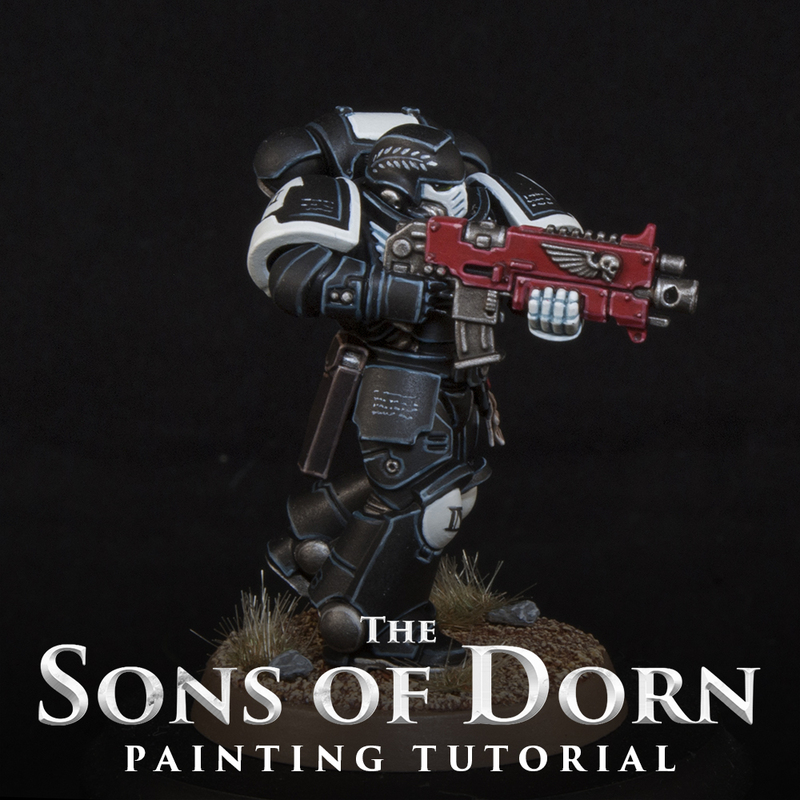 Comparing it to an older Sons of Dorn model of mine from five or so years ago, it is much crisper and clearer. It's always nice to see your own skills improve over time. I'm definitely excited to paint the rest of this army, although I think it may end up being more of a slow burn than I planned. At close to 1,000 points, the contents of the Dark Imperium box will be the first half of my army. The second half of the army will be made up of only Primaris Marine models and I look forward to seeing what else comes out for them. You can check out a 360º video of the model below. The white got a little blown out unfortunately, but it still came out pretty good. One of these days I will get a proper camera for videos.